Today's Letters: Dear Mr. Loerke, yesterday was the first day of winter. So in honor of it being a balmy 84° in Dallas we decided to watch The Santa Clause 2, drink hot chocolate, and listen to our favorite Christmas album while wrapping presents. Still hoping for another white Christmas this year. Dear Homies, Eeek! Do I really have to wait until January 1st to show you our new blog layout? It looks better than a gigantic glass of Ralphie's Ovaltine! Dear Ben & Jerry's, your NEW holiday ice cream has convinced me to brave Whole Paycheck today. With a name like "Mission to Marzipan" it's sure to make even Uncle Eddie feel AWESOME. 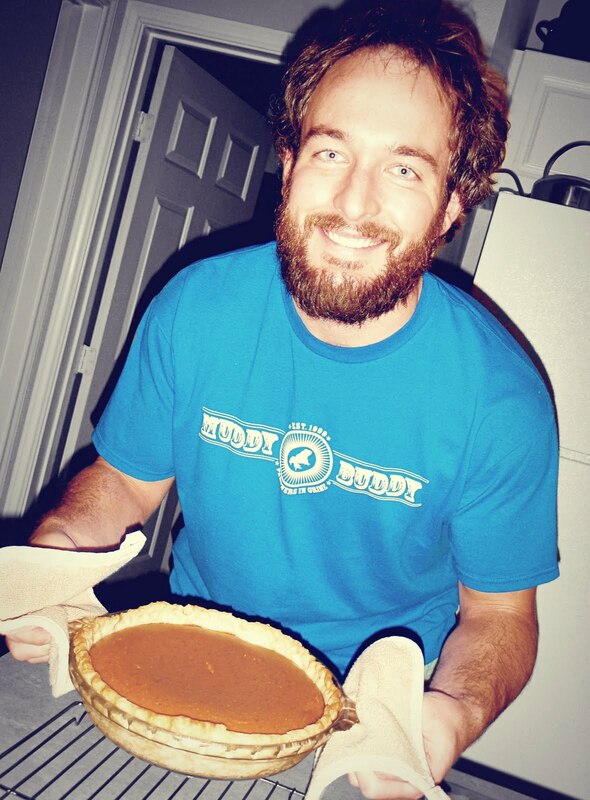 Dear Husband, whenever you rock a beard and bake pumpkin pies it makes me wanna make out. Just sayin. What's your favorite Ben & Jerry's ice cream? Team Loerke throws fist pumps for Coffee Heath Bar Crunch, Half Baked Froyo, Dublin Mudslide, and Phish Food. Oatmeal Raisin is the absolute best!! Woot woot! Strawberry Cheesecake. Sweet and salty bliss. I love Cherry Garcia... but I hadn't heard of this Mission to Marzipan.... must try it. I triple love marzipan! That's about what my husband's mug looks like right now. He's only done it once before, and we took pictures of him shaving it off in stages, as he portrayed whatever type of person would have that particular type of mug hair fashion. p.s. - Coffee Coffee BuzzBuzzBuzz and Chubby Hubby for the nom. However, I do see that they now have peppermint schtick and pumpkin cheesecake... must. locate. p.p.s. - I may or may not have once partaken in a two-person tag team to devour a Vermonster as our lunch one day at the office. Did we succeed? I'll never tell. Chubby Hubby is the best...of all time. Its semi foodgasmic. PS. LITTLE: LESS. THAN. 24. HOURS. BOOYA JACK BOWERS!! Coffee Heath Bar Crunch, and Brownie Batter!! Mmm...gotta make a trip to the store, now! That afternoon sounds perfect to me! Phish Food and Imagine Whirled Peace are favorites...but might have to try this new marzipan one! Pregnant lady likes ice cream (NO pickles)!! I am a Vermont girl (living in AL), so Ben & Jerry's is very near and dear to my heart. My all time favorite is Chocolate Fudge Brownie, followed closely by Coffee Heath Bar Crunch. As a little side note: my ex-stepmother's sister once dated Jerry.